Shield Azure, an abased bar wavy Argent, above a key Argent in pale ending in a duck foot. The bar wavy is representing Weissach Creek, name giver of the municipality. The strange key is taken from the arms of Unterweissach. It had been an ordinary key in the 19th century, the duck foot is known since around 1930. The tinctures are taken from the arms of Cottenweiler. 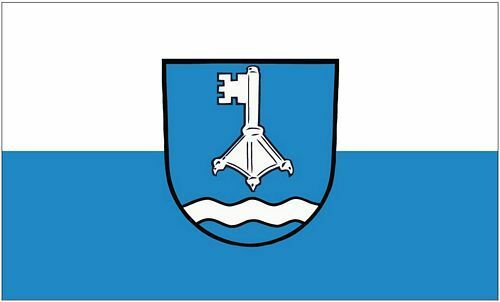 Flag and arms were approved on 7 June 1974 by Minister of Interior of Baden-Württemberg, published in GABl 1106/1974.